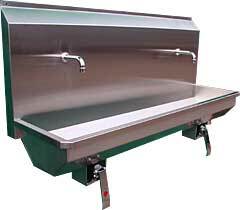 Wall mounted stainless steel hand wash troughs in either 1, 2 or 3 station models. 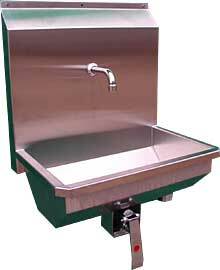 All manufactured from 320 grade s/s with satin finish and fitted with high quality knee operated valves. 3Kw Sensor operated heated units available in place of knee operated at additional cost. Soap and sanitiser dispensers available.